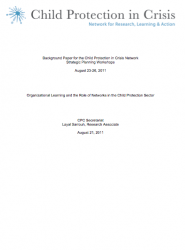 This paper was prepared as a prelude to the Child Protection in Crisis (CPC Learning) Network strategic planning meeting. It briefly addresses some of key issues of organizational learning in the humanitarian and child protection sectors, looks at the role of networks in learning, and presents a series of questions and thoughts to stimulate discussion and reflection on how to help professionalize the child protection sector and the role of the CPC Learning Network in that process. Its intended use is to stimulate thinking in the field, to ask questions, and push thinking forward.